Order your Montblanc Meisterstuck Doue Signum Rollerball Pen today from FahrneysPens.com. Fine Pens, Refills & Luxurious Gifts – great prices & fast shipping. The Montblanc Mesiterstuck Doue Signum rollerball puts the pleasure back into writing. The perfect combination of sophistication and style will compliment your daily life at home or in the office. The Montblanc Meisterstuck Doue Signum rollerball was elegantly created with a precious black resin barrel. Enjoy the subtle shimmer of the platinum plated cap and accents. For the first time in history, the Montblanc stylized star has been embossed into the classic black resin barrel. Beauty and convenience is yours without any messy ink stains. The capped design of the Montblanc Meisterstuck Doue Signum rollerball prevents unwanted ink marks in your pockets, organizers, and purses. 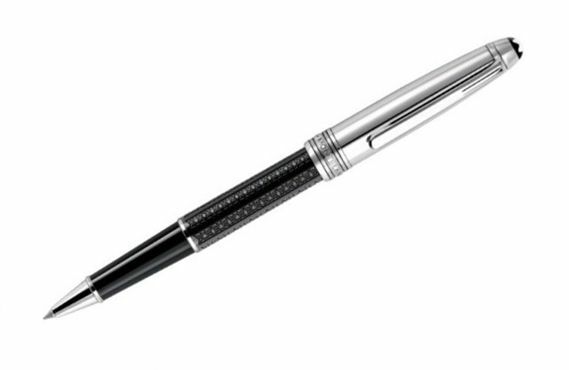 The Montblanc Meisterstuck Doue Signum rollerball also accepts fineliner refills. Pen Size and Weight: 5 1/4 x 1 3/8 1 oz.